Clients must bear in mind agile development means they must take actively part within the development process. Maybe some clients don’t like this way of work. Maybe they prefer to pay for the service or deliverable and let the work for us. But really it worth the effort. Work close to the client is one of the principles of agile development. One important action to obtain the commitment between both parts is give access to the customer to the Bug Tracker. With this simple step our customer can track our work. But there’s a problem. Our bug tracker is not only an internal development tool now. It has become also into a communication tool. That’s means developers maybe decide don’t report internal technical things because they don’t want to be read by the clients. 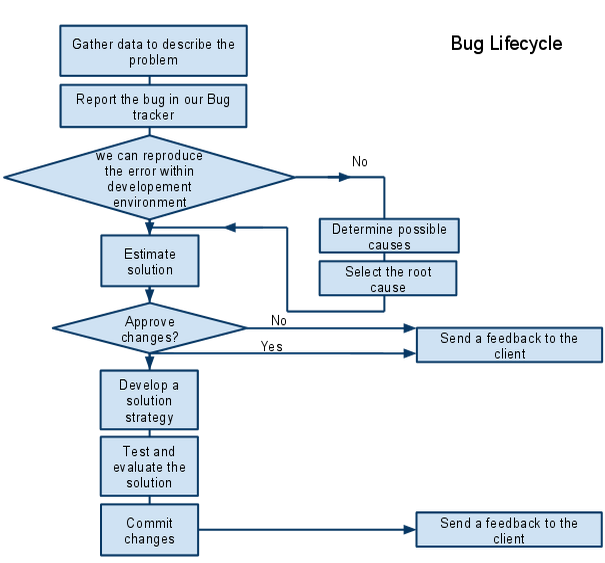 Bug trackers can help us in our agile developement. There’s a lot of bug tracking software over there. Open source software you can install in your host, such as Mantis or Track. You can find also hosted solutions, free or paid ones. Probably Jira is the most famous and widely used software(not a free software). What do you think about this flow chart? Do You think is it is up to your requirements? Posted on October 24, 2010, in Project Management, Technology, tips. Bookmark the permalink. 2 Comments. I think this diagram lacks some important steps that we added in my company. A fix process must be integrated within a support lifecycle and continuous improvement methodology. First there is the Error discovery, which can be a mail, a ticket in a tracker….one must then acknowledge the client contact or the product owner that the bug is effective or not and we will investigated by “this person” or “this team” and that we’ll be back in touch at 5pm today…. Then your flowchart is perfect to me until “approve changes” where we must not forget to send back to the client when the bug resolution is scheduled if the change is approved. Flowchart updated. I’m agree with you. Client must known if change is approved or not and he must known we are working on it (or not). In fact client must have access to the Bug tracker to follow the issue. The access to the Bug tracker normally is a source of discussion in the development teams. Sometimes when we open the bugtracker to the client, the Bugtraker becomes into a commercial tool instead of a development tool. For example if you see something really wrong within source code, will you report it knowing your client is reading? Or maybe you will solve the problem and later you will log it when it’s solved? I have seen teams who think open bugtracker to the client is mandatory, but another teams who think it’s a terrible mistake.